Tell Larisa Renar about your progress! International Center for Women's Development with training on the concept of "The circle of feminine power", first described in the novel of the same name. All-Russian tour of Larisa Renar “Women’s Time” from September 21 to December 10, 2016. From Kaliningrad to Khabarovsk in 80 days! In honor of the tenth anniversary of the publication of the best-selling novel Circle of Women’s Power, Larissa Renard will visit 18 cities of Russia, where she will hold meetings with readers, the master class “Circle of Women’s Power: Reloading” and other events. Meet Larisa Renard in your city! Project-show, project-training, project-game. This is a project about women, for women and for the sake of women’s beauty and influence. It includes a cycle of webinars and a show training on how to be fatal, influence the destiny of men and the world, and remain in the hearts of people and in the pages of history. To change the world, while remaining a woman, carrying love and beauty! A public person, a bright woman, a successful business-woman, a charismatic hostess and a popular writer — with these talents Larisa Renar just cannot stay in the shadows! Larisa Renar is a psychologist from God, a high-level professional. In the project “Ty nam podkhodish!”, where the heroine does not see potential suitors, Larisa offers girls that guiding thread, by which she will be able to determine the favored one, without being distracted by appearance. We really look for the person suited to four levels: sexual, material, intellectual and emotional. At the end of the program, men open their secrets to me. I will tell you a secret, Larisa has never made a mistake in assessing the potential partner! I got acquainted with the work of Larisa Renar long ago, 8 years ago. My friend presented me the books of Larisa “Circle of feminine power” and “Discovering a new yourself”. I began to read, but at that time, I did not know yet that Larissa holds female trainings. To be honest, this is a unique experience, because you cannot get such knowledge as hers anywhere else. All my friends who have visited her trainings are lost in admiration. I believe that what Larisa does is very important, because many girls do not even know what to begin with to accumulate a feminine energy and self-confidence. Larisa, as no one else gives a positive impulse and opens up great opportunities to her readers." "My co-host, a good psychologist, an intelligent woman, a nice kind person, Larisa Renar gives psychological portraits of characters. I think after watching our program people looking for a couple, will understand:choosing a life partner you need to look not only at his appearance and listen to what he tells about himself, it would be good to talk with his relatives and friends (...). My husband, Alexander Ivanovich Dontsov, Doctor of Psychology, was present at our shootings several times and said that Larisa Renar is a beautiful, smart specialist. She shows good techniques, they are simple, easy to use yourself, but they are effective." Daria Dontsova, a writer, co-host of the project “Ty nam podkhodish!”.The text is provided by the press service of the TV channel Domashniy. “We have known each other with Larisa for a long time. She is a very positive, charming person charging with a woman’s energy. When you talk to her, you understand that a woman is capable of great wondersand nothing is impossible! This is a person, who knows how to achieve her goals. She is a unique woman because she really knows the art how to achieve her goals in a nice and kind manner. In addition, of course, this inspires me much. After talking with her, it seems that I acquire wings.Talking about Larisa as a professional, of course, she is a professional with a capital “P”. To each question, she finds an accurate answerstunningly fast. Moreover, if you cannot overcome any problems, it is enough to tell her a couple of words, and she will understand you. Therefore, if someone faces serious, not domestic, but personal problems in his life, then, I definitely advise to turn to her, because she is a person of great depth, a wise psychologist and knows very well the psychology of women and men. She can help in a difficult situation better than anyone can. I deeply respect and love her very much." 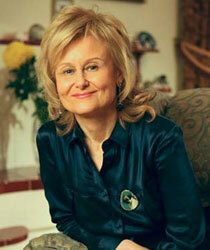 Larisa Renar a few times a month appears on TV and in the media as an expert psychologist. Her performances are always interesting, clear and accessible for every woman. Breakfast with Larisa Renar — a special offer Do you want to talk with Larissa Renar face-to-face? About the relations in the family, business, career, creativity? Leave an application for breakfast in any city in the world: personal manager will contact you and discuss the details! Larisa Renar— inspired and inspiring! Watching her life is both a pleasure and benefit. Her story isa vivid example ofthe fact that our happiness depends only on us. Join Larissa Renar on the social networks.